David Granick was born in 1912 and lived his whole life in Stepney. A Jew, a keen photographer and a long-serving member of the East London History Society www.mernick.org.uk, he gave lectures on various local history themes illustrated with colour slides taken by himself or his fellow members of the Stepney Camera Club. Bequeathed to Tower Hamlets Local History Library & Archives after his death in 1980, where they have been preserved ever since, these photographs show the East End on the cusp of social change. 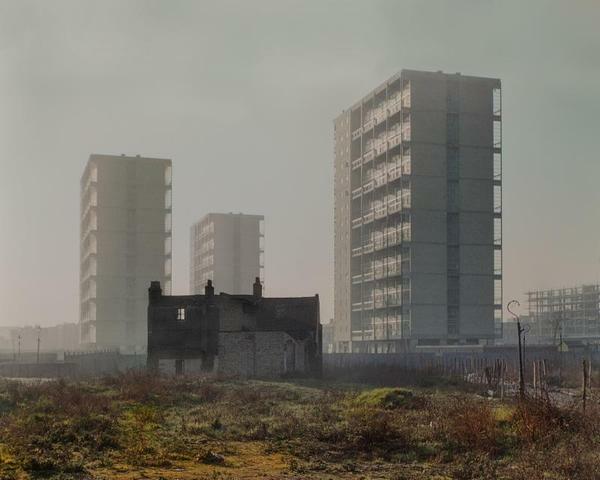 These amazing photographs are now to be exhibited for the first time at Tower Hamlets Local History Library & Archives, from Saturday 3 February to Saturday 5 May. To coincide, selections from the David Granick collection are also to be published in a beautiful hardback book, The East End In Colour, 1960-1980, by Hoxton Mini Press www.hoxtonminipress.com. This book can be purchased directly from us at the discounted price of £15 during the exhibition. The book and exhibition have been curated by local photographer Chris Dorley-Brown. A few years ago, volunteers began gradually to scan the slide collections we hold, and a few were posted on our social media. Chris, a collaborator of ours on a number of recent projects, immediately recognised the special quality of those taken by David Granick and volunteered to digitise them all himself in a higher quality, removing any dust and scratches. For this exhibition, our staff have worked with Chris to present the images as Granick originally showed them during his lifetime – using a carousel slide projector. Visitors are invited to take a seat in a darkened area in the centre of our exhibition space and watch eighty of Granick’s slides appear on screen in rotation. In addition to this, copies more than 200 images will be hung on the walls of the exhibition hall with a blank space beneath ready for you to add your memories of the people or buildings pictured. The exhibition is free of charge. The first few events we have scheduled to tie in with this exhibition are listed below. Please keep an eye on our social media and website for more events to be added in March and April! Visit www.ideastore.co.uk for further info. Photographer and exhibition curator Chris Dorley-Brown will discuss the work of David Granick which he has digitised and researched. ALSO, weeks before its main release on 22 February, visit the exhibition to purchase the book from us directly for the discounted price of £15! A selection of documentary films, arranged and hosted by Bea Moyes, showing East End lives during the period illustrated in the exhibition. Check our website for details of the films we will be screening a bit nearer the time. More events to be programmed - keep checking our website! All our events are free and no booking is required.